Brand Name︰ Your logo can be printed easily. Test any of your batteries with this low cost and easy to use battery tester. Just swing out the battery tester arm and fit to your battery size, a light squeeze and watch the measuring meter go up! 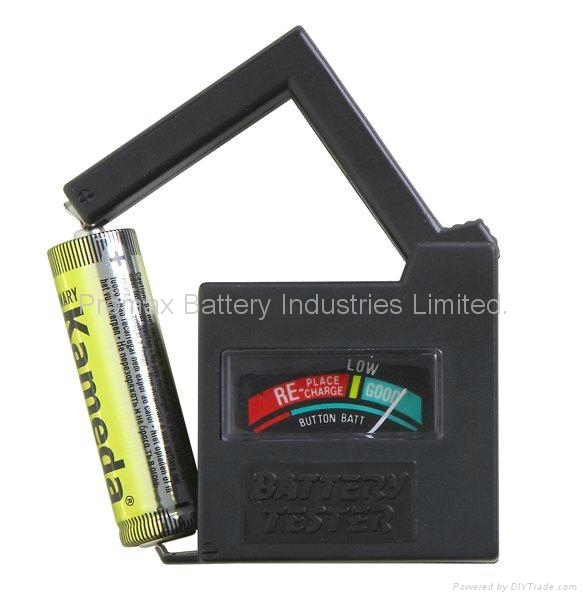 This battery tester will measure voltage on D, C, AA, AAA, 9 Volt, and button cell batteries. Small enough to fit in your pocket too. Specifications︰ A simple and easy to use tester for most types of standard domestic and rechargeable batteries to help ensure they are fully charged and ready for use. A simple analogue needle display indicates the power level of the batteries (good, low or replacement required). An adjustable arm allows the tester to accommodate the testing of D, C, AA, AAA, 9V batteries and 1.5V button cells and folds down for easy storage. Advantages︰ Use it to quickly check various batteries: D,C,AA,AAA,N,9V and 1.5V Button Cells. Easy-to-read color-coded display with “Good”,“Low and “Replace/Recharge” indicators. Works with standard and rechargeable Batteries.